1. Place a medium size saucepan onto a medium heat, melt the butter and fry the chopped onion for about 3 minutes until it becomes translucent. Lay the haddock fillets on top of the onions with the bay leaf and pour in 500ml of the milk so it covers the fish. 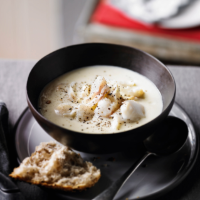 Bring the milk to a gentle simmer and cook the haddock for about 5 minutes until the flesh is opaque and the fillets can be easily flaked. 2. Remove the haddock fillets and leave on a plate to cool. Add the sliced leeks, potato cubes and the remainder of the milk to the pan. Gently simmer for another 10 minutes until both the leeks and potatoes are cooked through. Take out the bay leaf. Use a hand blender to blitz the soup until smooth. 3. When the haddock is cool enough to handle, gently break the fillets up into small flakes and remove all the skin and check for any bones. 4. Add the haddock flakes to the puréed soup, add the single cream and seasoning to taste. Serve with buttered crusty bread, garnished with chopped parsley if you wish. This recipe was first published in Wed Nov 26 11:00:00 GMT 2014.